Late August/ early September would always mean the first sightings of the following year's annuals (for late-comers: British annuals, despite being pitched firmly at the Christmas market, would always be dated - if dated at all - for the following year so, in 1985, you would expect to find 1986 annuals on sale) in WH Smith, Martins, Woolworths and other newsagents/ booksellers. The line-up would generally be spin-offs from existing (and often long-since defunct) comics, flavour-of-the-month media characters from TV and film, pop stars and more general (and, to be, duller) gender-specific slightly-worthy tomes which you'd never get excited about but - presumably - unsure older relatives would consider a safe bet gift. Having a September birthday had one advantage: the ability to draw-up a first-round wish list long before Christmas. 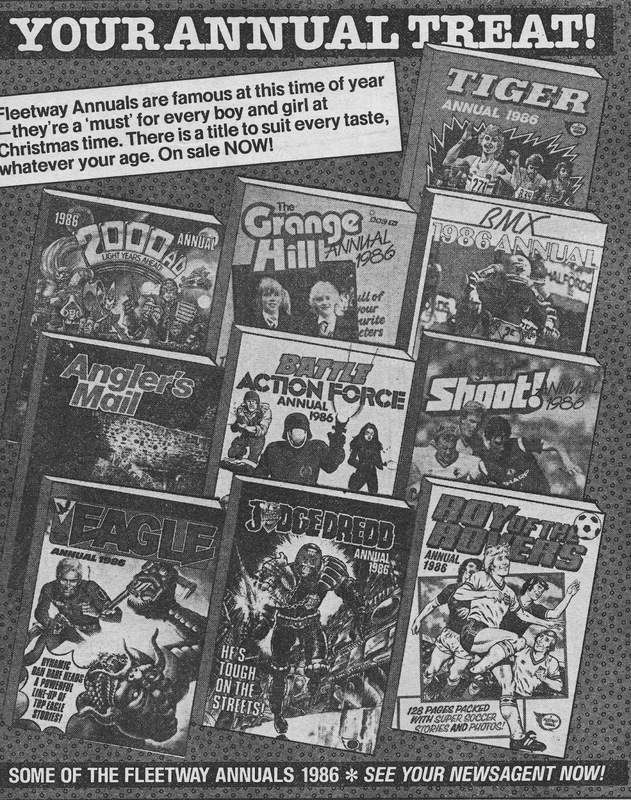 In those days, annuals were still a big deal (the margins were probably massive for retailers) and any half-way decent retailer would give them a large display fixture (normally a table of some sort) which could then be scanned eagerly for any likely candidates. Christmas was the second-round of the gift-list. Scooping up anything not available... or at the bottom of the birthday list... a few months earlier. Round-three was the post-Christmas sales when retailer would often hastily reduce their remaining stock to get shot of them ASAP. Round-four was when overstocks and unsolds hit discount booksellers and market stalls. That was often a chance to snaffle-up editions that had suffered from remarkably poor distribution in proper retailers. I recall being able to pick up STAR TREK: THE MOTION PICTURE, MISSION GALACTICA: THE CYLON ATTACK and SECRET WARS from those outlets. Then - of course - there was the less reliable - but often rewarding - secondhand and charity shops. DOCTOR WHO and MARVEL annuals seemed to be a specialism of such outlets and a canny shopper could - over time - accumulate quite a collection. This is an IPC house ad, from November 1985, plugging some of the Fleetway wares for the following year. They churned-out dozens of annuals each year so this would only be a male-friendly sampling (the ad appeared, after all, in the EAGLE). I know, from the covers featured, I had the EAGLE, 2000AD, JUDGE DREDD and BATTLE ACTION FORCE books that year. I always looked forward to my parents' Winter catalogue so I could examine that year's annuals. Although I switched to Marvel comics in 1974 I continued to get the Beano annual for several years as there was something special about annuals as opposed to the weekly comics. I have fond memories of the '70s Star Trek annuals, especially the 1976 one for some reason.